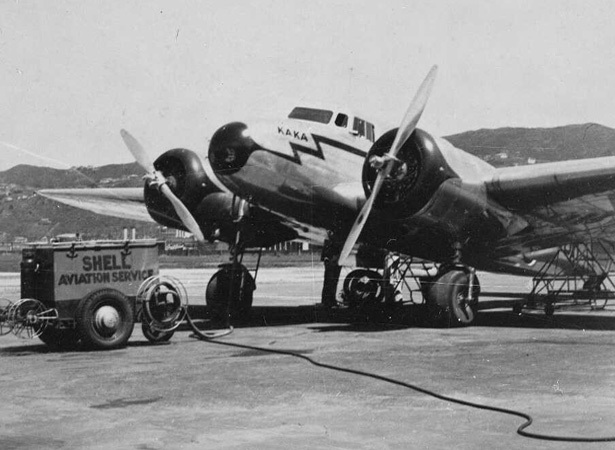 On the morning of 23 October 1948 two experienced pilots, Commander Max Hare and Second Officer Brian Russell, flew ZK-AGK Kaka, a Lockheed Electra of the National Airways Corporation’s fleet, from Hamilton to Palmerston North. They were to make the return journey later that day. At 1.16 p.m., after refuelling and taking on board 11 passengers, Kaka took off towards Whanganui. This dog-leg added time and distance, but kept airliners clear of the peaks of Ruapehu, Tongariro and Ngāuruhoe at a safe cruising altitude, in an area where navigation beacons were scarce. Kaka initially appeared to be on course: it reported its presence at the Whanganui beacon at 1.38 p.m, when it was flying in heavy cloud and rain, and was later seen overhead at Ōhakune. Fears began to be held for the safety of the crew and passengers when it failed to report its position 30 minutes north of Whanganui, and did not arrive in Hamilton as expected. An intensive aerial search ensued. Numerous military and civil aircraft searched each day until the light failed or they were stopped by bad weather. But with hundreds of people saying they had heard an aircraft in trouble, their efforts were dispersed across the centre of the North Island. A breakthrough finally came when three deerstalkers came out of a densely wooded area on the western side of Mt Ruapehu. They said they had heard an aircraft’s engines cut out near the mountain on the day Kaka went missing. Eventually wreckage approximately 900 m from the summit of the mountain was detected from the air. Search parties left for the site on the morning of 29 October. Little hope was held of finding anyone alive – weather conditions on the mountain had been poor and almost a week had passed since Kaka had disappeared. When the searchers arrived the following day, the passengers and crew were found to have been killed on impact. The bodies were recovered, wrapped in blankets and parachute material, and carried down the mountain to Horopito. The board of inquiry into the crash concluded that the aircraft had gone off course because the pilot had made an error in his calculations. According to John King, author of New Zealand tragedies: aviation accidents and disasters, he had corrected for right-hand drift on his flight to Palmerston North, and then, instead of subtracting this and applying it to the other side for the return flight, added another right-hand drift correction. The lack of navigation beacons in the central North Island was a contributing factor. Airliners now cruise at significantly higher altitudes, well above the mountains. Smaller aircraft fly through the area at lower altitudes, but only when weather and visibility allows. We have 9 biographies, 9 articles, related to Mt Ruapehu air crash kills 13.